Can I get a 5-day visa ("Shenzhen Special Economic Zone Tourism Visa") when entering Shenzhen through the Guangzhou–Shenzhen–Hong Kong Express Rail Link from Hong Kong (West Kowloon, connection opened for public on Sunday 23 September 2018)? I am a French citizen if that matters. It is currently not possible to get a 5-day visa when entering Shenzhen through the Guangzhou–Shenzhen–Hong Kong Express Rail Link from Hong Kong. The Guangzhou–Shenzhen–Hong Kong Express Rail Link doesn't stop at any station that delivers such visa. Instead, the Chinese immigration checkpoint is located at West Kowloon, and one must go through it before taking the train to China. Mainland authorities will conduct customs, immigration and quarantine duties in part of the [West Kowloon] station, while mainland Public Security Bureau officers would be responsible for “managing public order”. 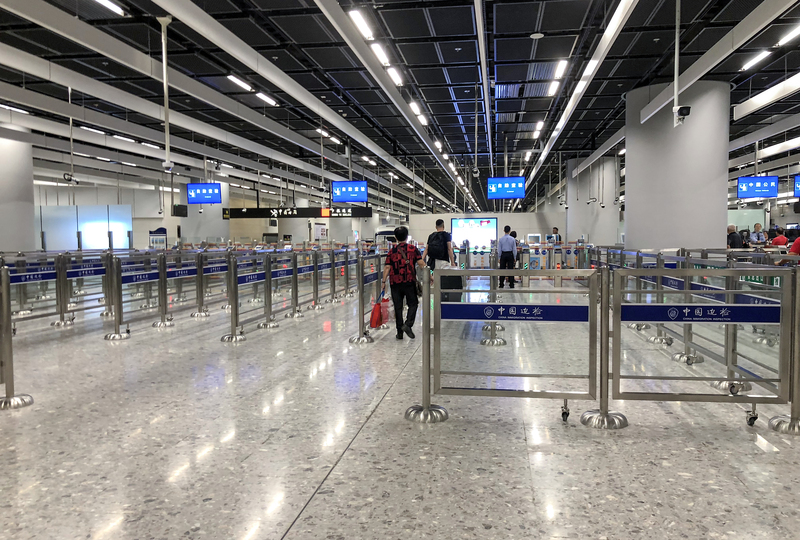 Note that if you don't hold a Chinese visa, there is no facility to obtain the special short-term 'Shenzhen visa' at Futian – you must have a Chinese visa before you board the train at West Kowloon station (indeed, you'll need it to pas through the station's Chinese immigration checkpoint). This is different to the system in operation at the Hong Kong-Shenzhen border crossing of Lo Wu, where many travellers from Hong Kong step off the East Rail Line and take out a single-visit Shenzhen visa on arrival – so if you want to visit Shenzhen but don't have a Chinese visa in hand, you'll need to take the slow train. Not the answer you're looking for? Browse other questions tagged visas trains china hong-kong shenzhen or ask your own question. Where can I find the official Shenzen Special Economic Zone Tourism Visa details? How long do I have to wait before being able to go back to Shenzhen again with another Special Economic Zone visa? And how often can I do so? Do I have to register at the police station if the hotel doesn't do it for me after entering China with a Shenzhen Special Economic Zone Tourism Visa?